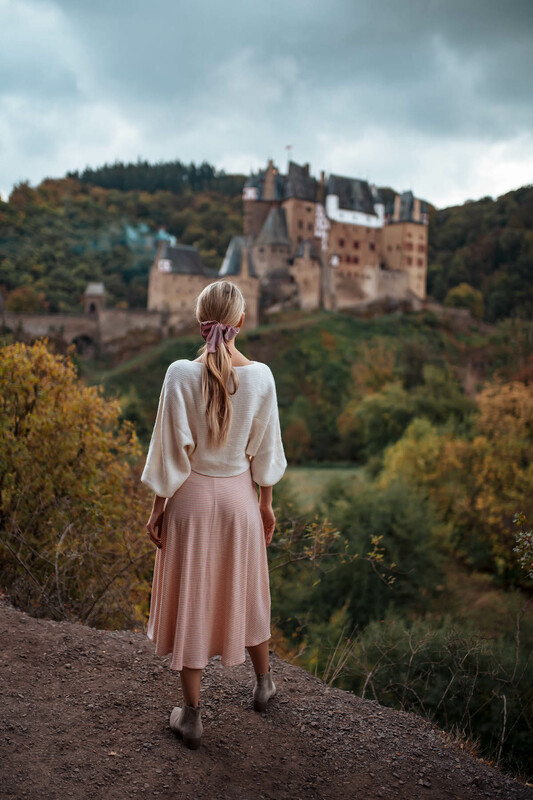 Does seeing a photo of a Medieval castle trigger major wanderlust? 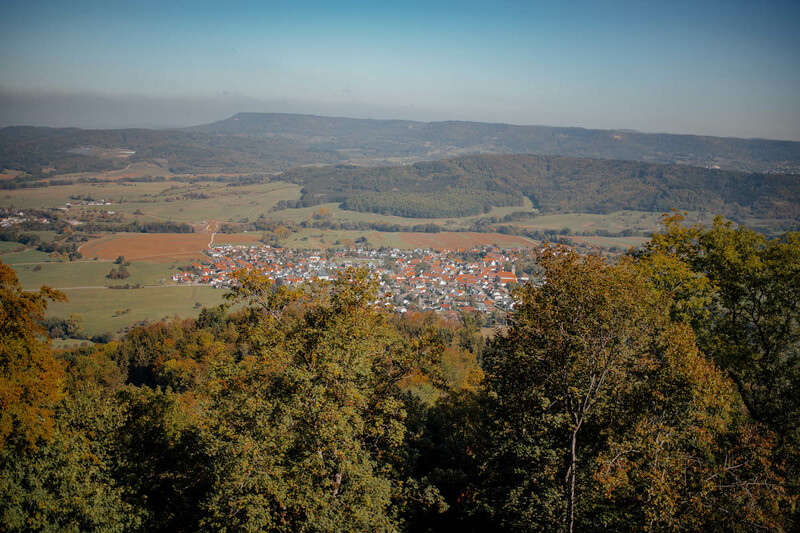 Do you wish you could live in a village straight out of a fairytale? Or do you just like beer or wine? 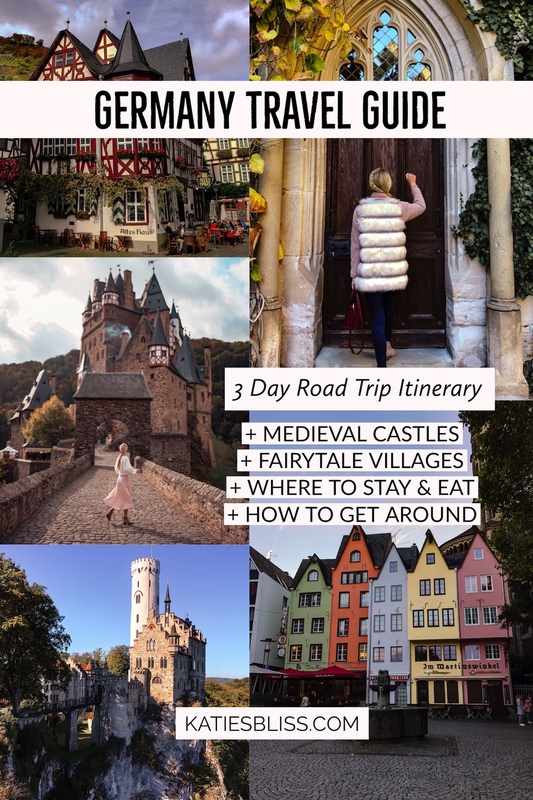 Then this Germany road trip itinerary and travel guide is for you! 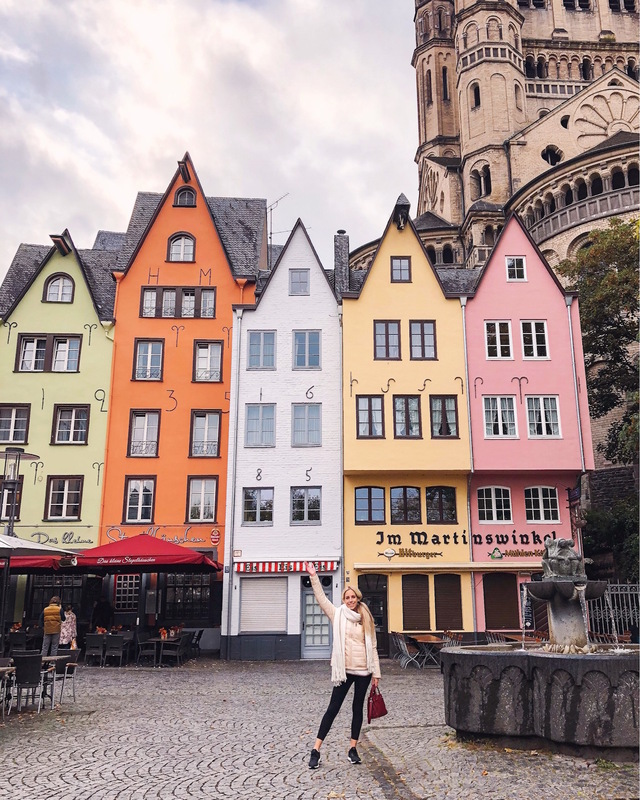 After spending 3 wonderful days in London, we hopped aboard a Eurostar train and in under four hours we found ourselves at our next stop: Cologne, Germany. 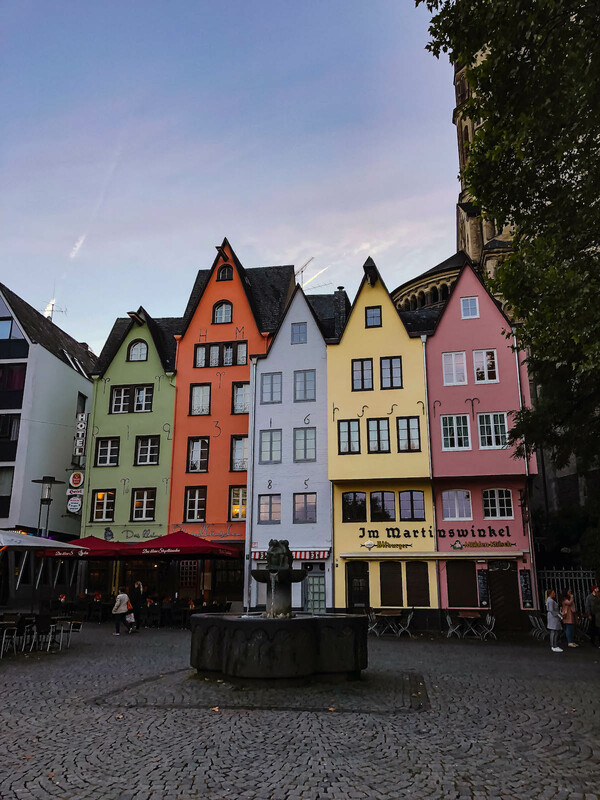 I’d fantasized about visiting Germany ever since I was a little girl (I explain some backstory in this post) and despite having only 3 days I was able to cross a lot of sightseeing and landmarks off my bucket list. I’ll be honest though– we went FAST and furious. Our itinerary may not look like a lot, but believe me we were going from 7AM/8AM until 11PM every night. 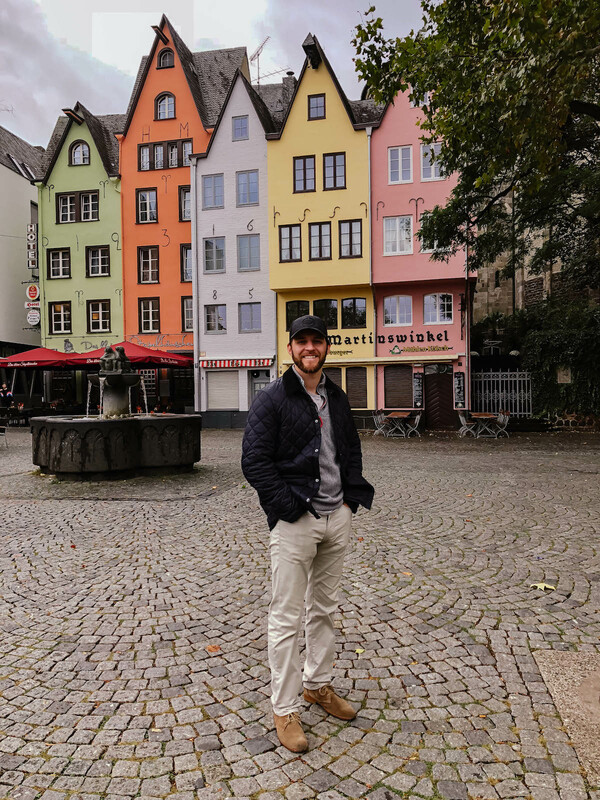 That said, Germany did not disappoint me and I wouldn’t have had it any other way! 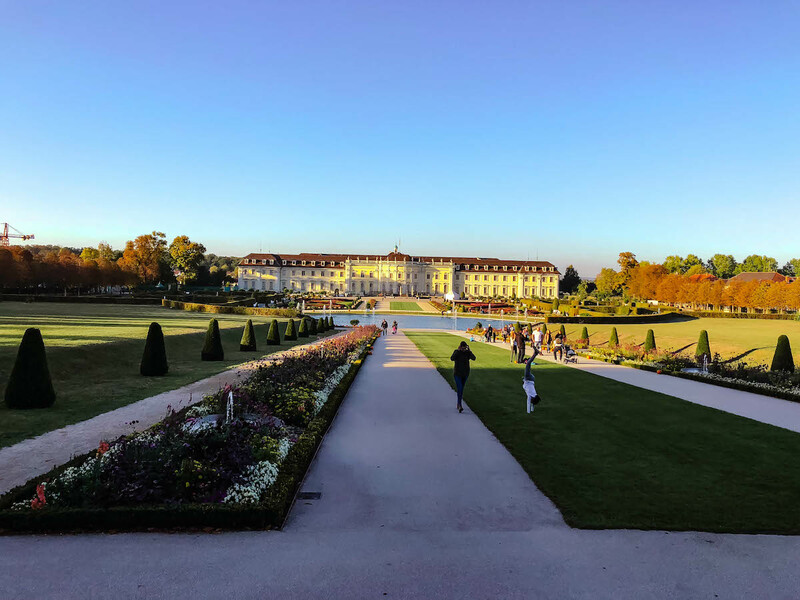 I mentioned in my initial Fall Eurotrip Itinerary (where I broadly outlined our full travel plans for London/Germany/France) that I had been worried this portion of our trip would feel disjointed or not pan out as we’d expected. Renting a car in Europe for the first time (I talk more about this later in the post) and the fact that many of the spots we’d bookmarked were smaller and off the beaten path all contributed to my pre-trip anxiety that of course ended up being totally unnecessary. 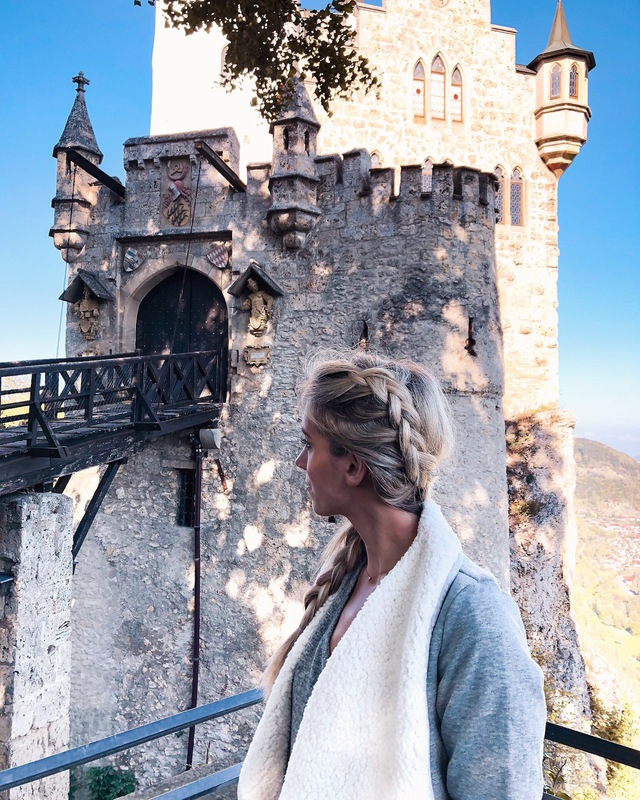 Looking back there are definitely a few things we would’ve done differently (I mention these below) but all in all, I think our itinerary turned out great and would be perfect to follow if you are interested in seeing some of Germany’s most beautiful Medieval castles and fairytale towns. You can take a train from London to most large German cities, but we chose to head to Cologne first. 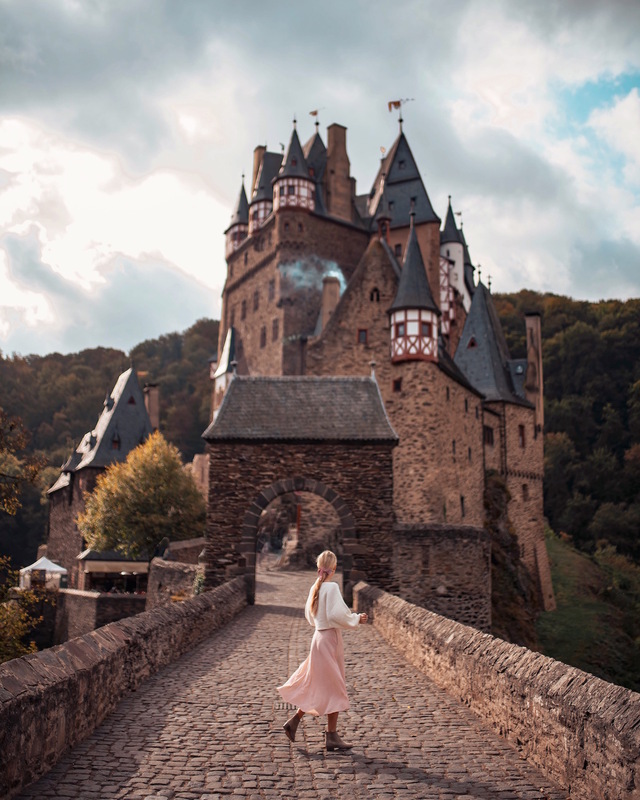 We made this decision because Cologne’s central location in west Germany would allow us to then road trip south along the Rhine River and stop at many of the castles and other landmarks on our way to France. The first thing we did upon arriving in Cologne was pick up our rental car from Sixt. 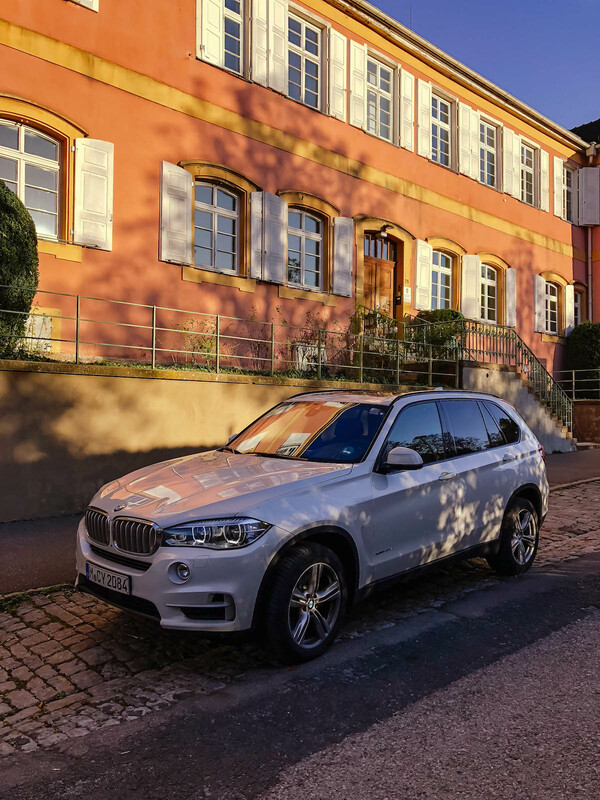 Since we had a few large suitcases an SUV was definitely necessary and we loved the BMW we ended up getting. If you’re planning to visit smaller towns or spots that aren’t near a big city, I’d highly recommend getting a vehicle. We loved it and it made getting from place to place so much more comfortable. Driving on the Autobahn was a ton of fun too! Our train from London was super early so when we arrived in Cologne it was still morning and we couldn’t check into our hotel yet. 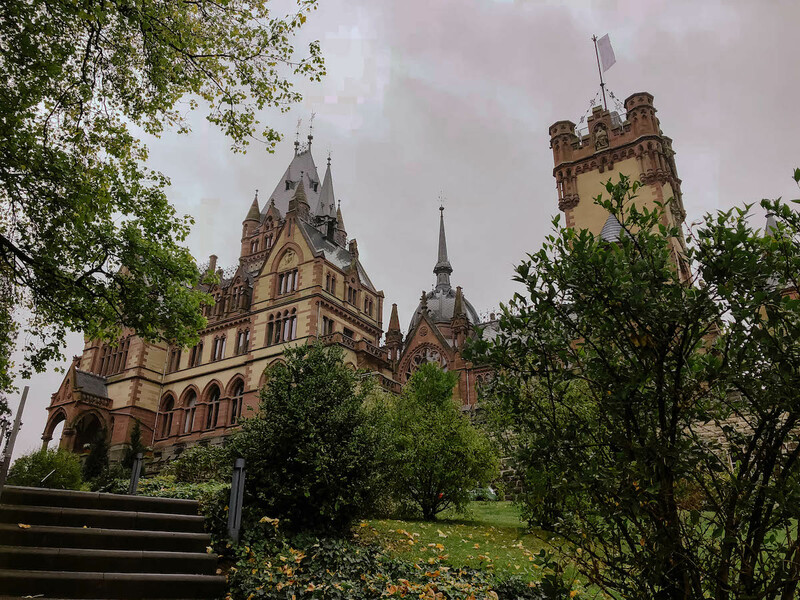 Since we had some time to kill and we were already in our rental car, we decided to take a quick 30 minute drive outside of the city to nearby Drachenburg Castle. 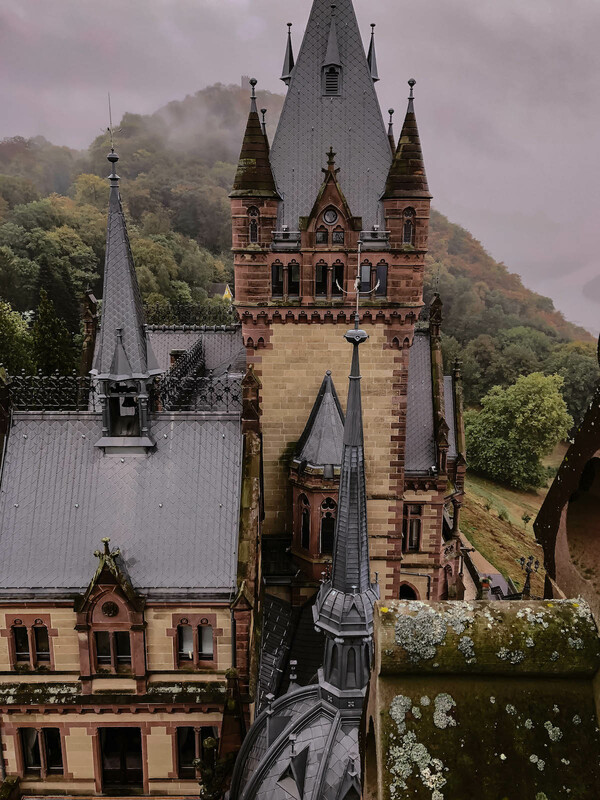 Despite it’s striking exterior, Schloss Drachenbaurg is actually one of Germany’s “newer” castles. 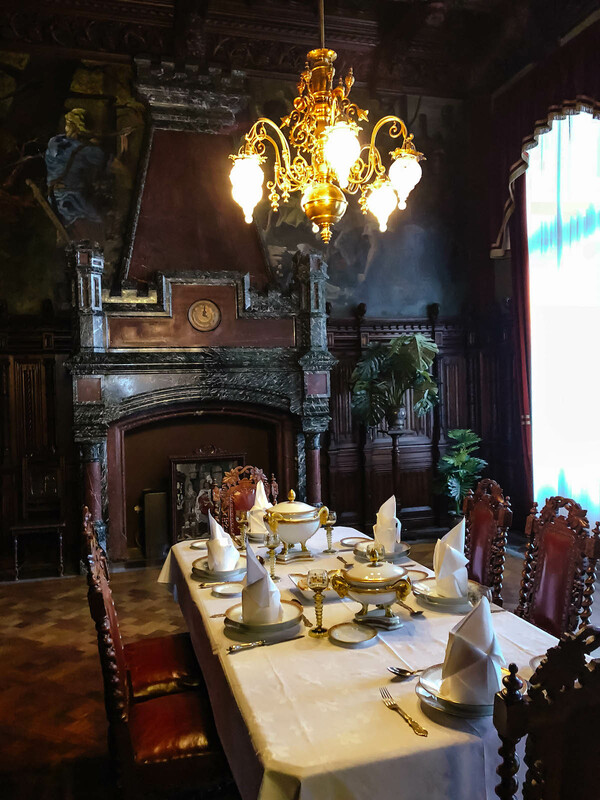 A banker named Baron Stephan von Sarter constructed the private villa in a palace style in the late 19th century, but ended up never moving in. 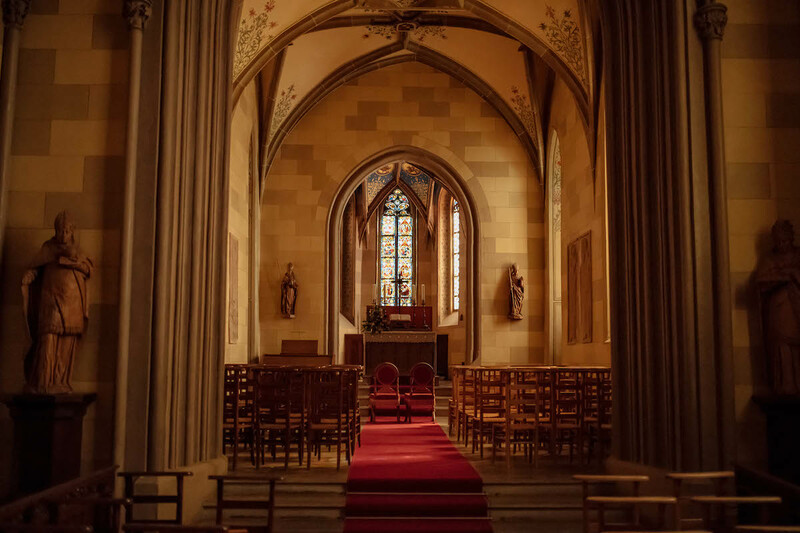 Today it is still fully furnished and open to the public for self-guided tours (tourists are provided an audiobook + headset in the language of your choice.) We felt like we were visiting Hogwarts! 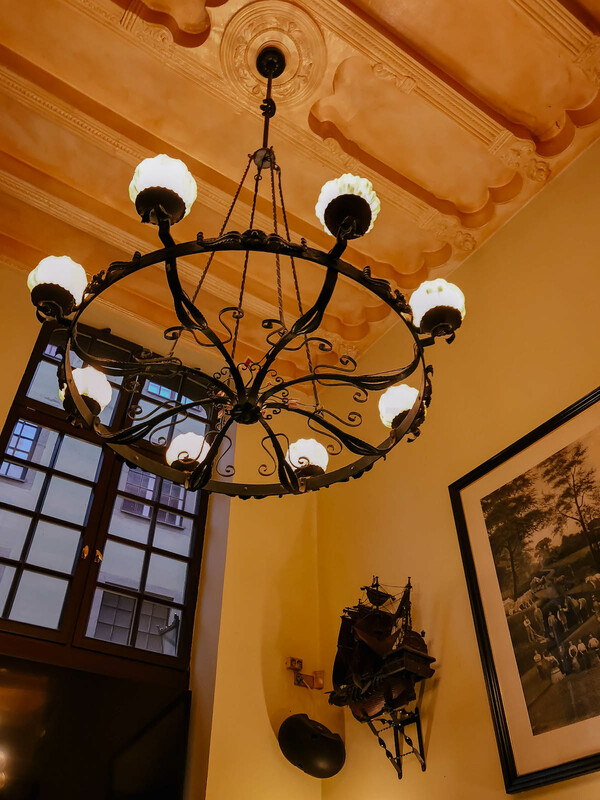 After we finished touring the castle, we drove back to Cologne and checked in to our hotel (we stayed at the Mondial– it was nothing special but the location was convenient.) 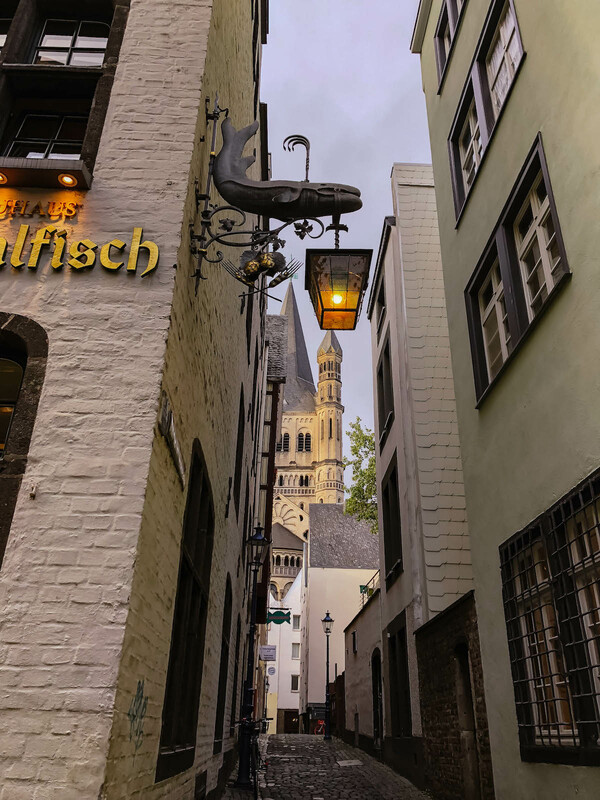 From there we did our own exploring on foot around Old Town Cologne and the Belgian Quarter. 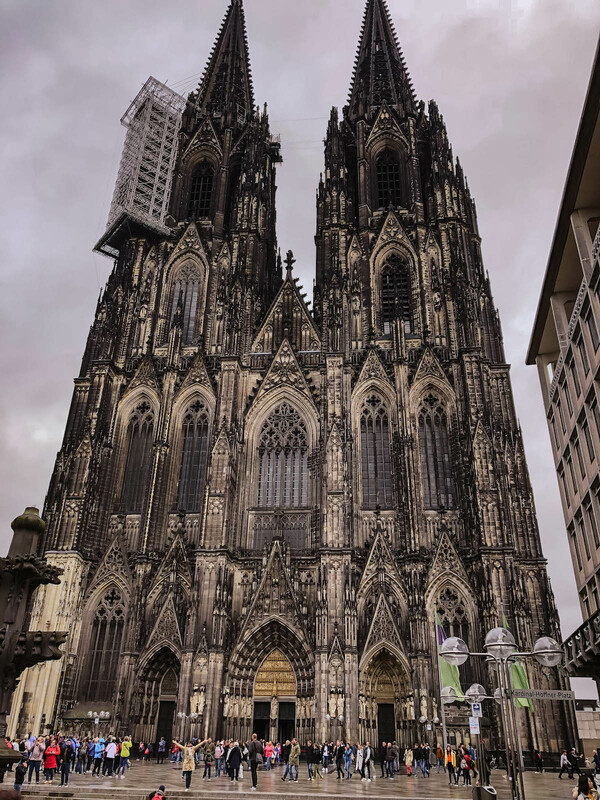 By far the most incredible landmark we saw was the Cologne Cathedral. There’s absolutely no missing it.It’s the tallest structure in the city and truly striking. 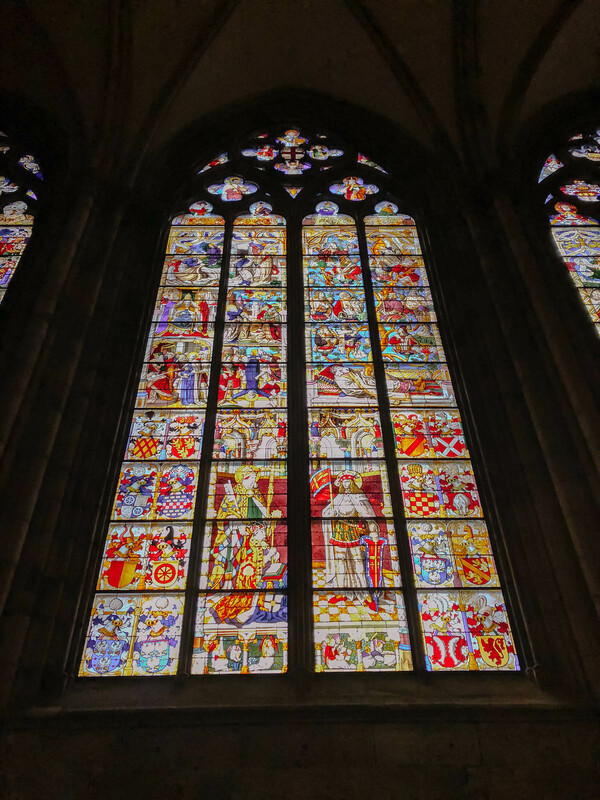 To think something that large and ornate could be constructed centuries ago is mind-boggling. 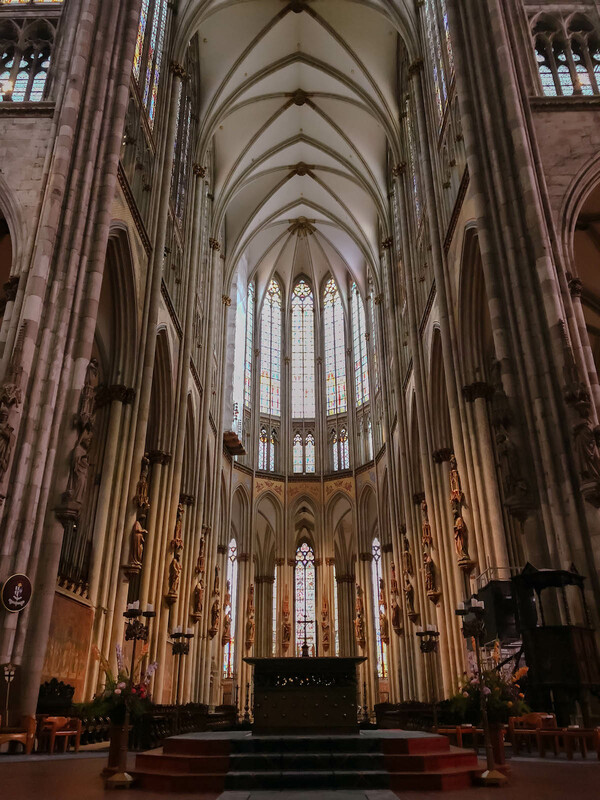 We walked through the cathedral truly in awe of it’s beauty and size. 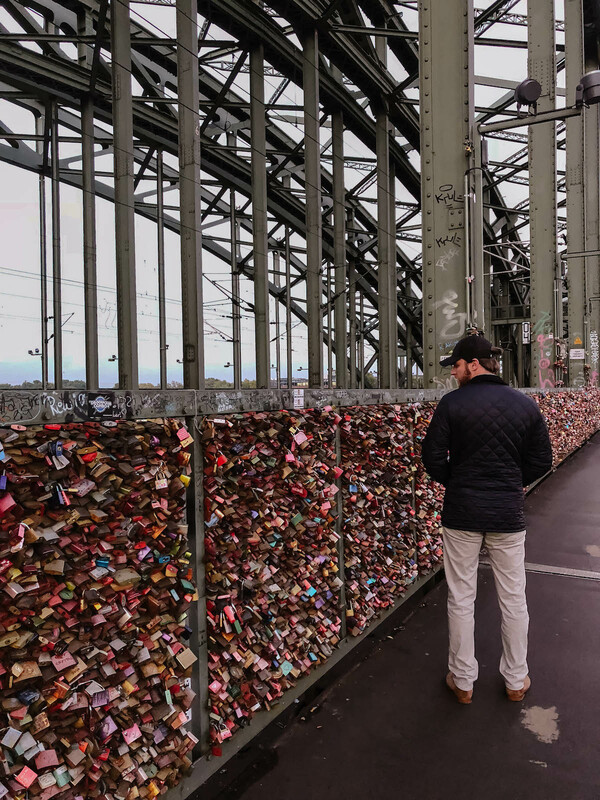 We also checked out Cologne’s famous Hohenzollern lock bridge. 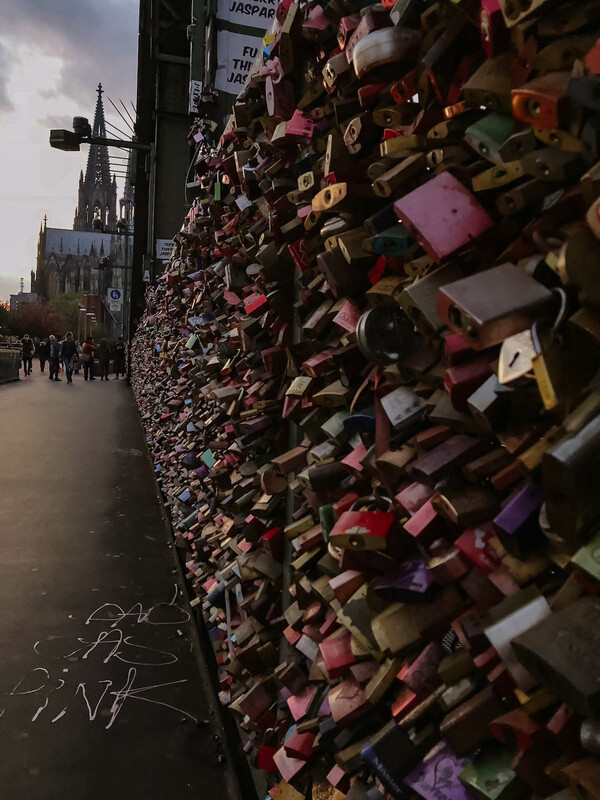 I was so bummed when we visited Paris that the love lock bridge had been removed so I was really pumped to see Cologne still had their’s in tact. We soon found ourselves famished so we stopped for the obvious meal you get your first night in Germany: SCHNITZEL! 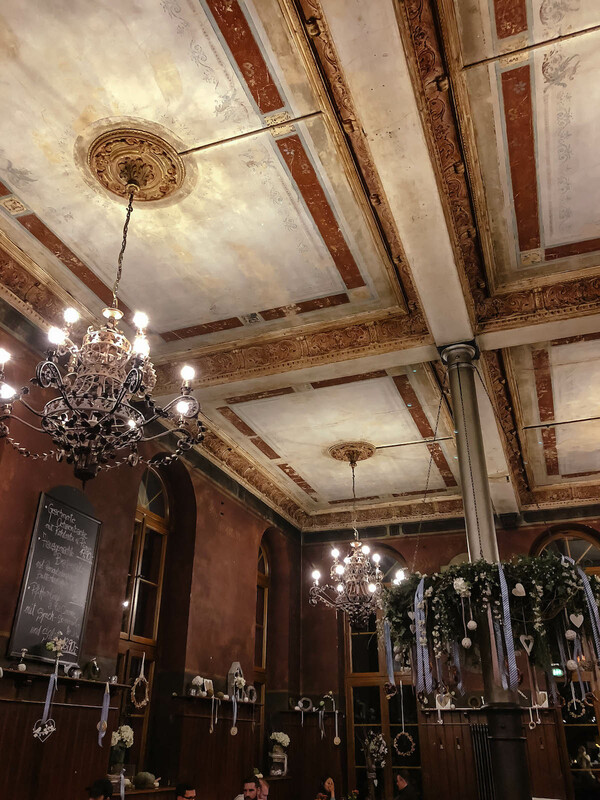 I’d bookmarked a few different breweries and the one we ended up stopping to eat dinner at was Brauhaus Sünner im Walfisch. It HIT. THE. SPOT. 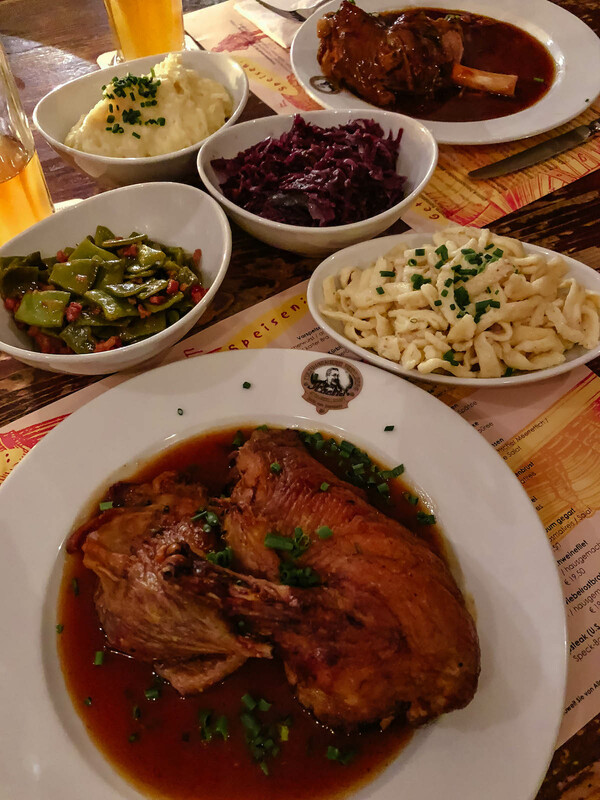 Germany cuisine is totally my kind of food. Fried and salty 😛 For a nightcap we grabbed local beer at a nearby bar, Craftbeer Corner Coeln. NOTE: Cologne can honestly be explored in a few hours and looking back it probably wasn’t necessary to spend a night there. 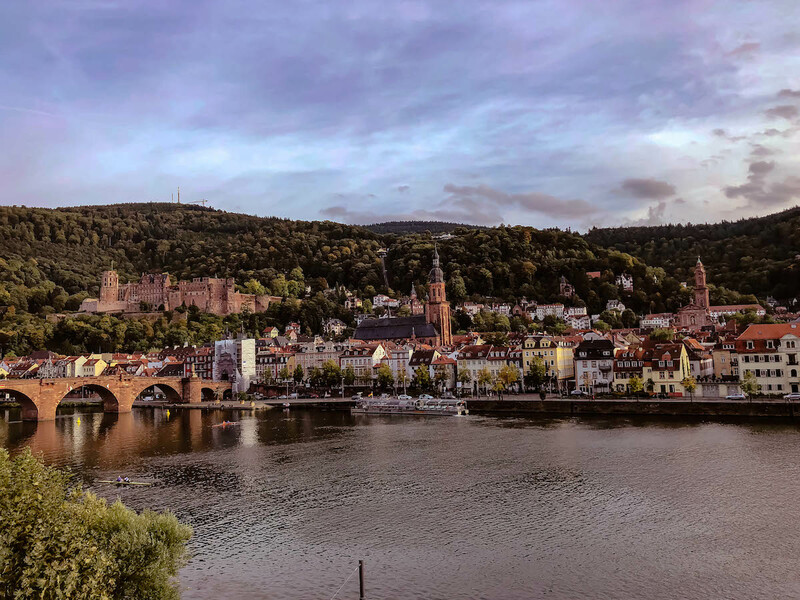 If we were to do this trip again we would’ve just driven straight to Heidelberg after checking out the sites I mentioned above. 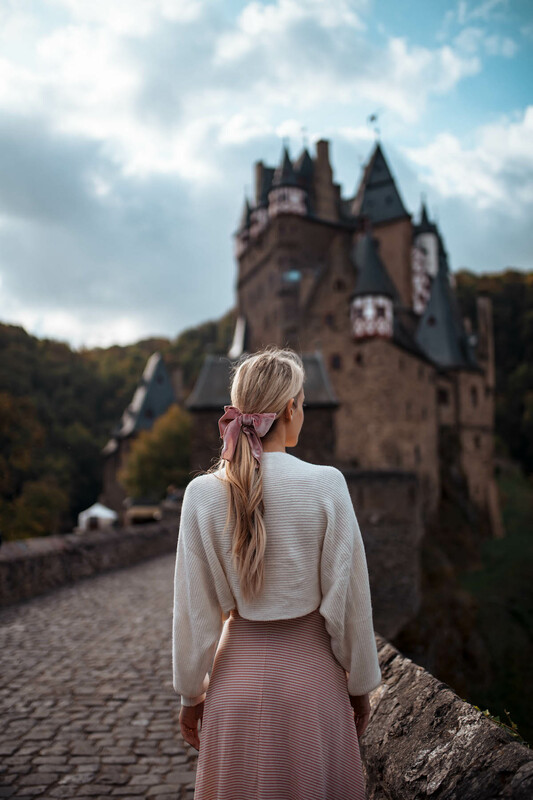 We hit the road super early on Day 2 of our German adventure in the direction of one of the country’s most recognizable medieval castles: Burg Eltz. 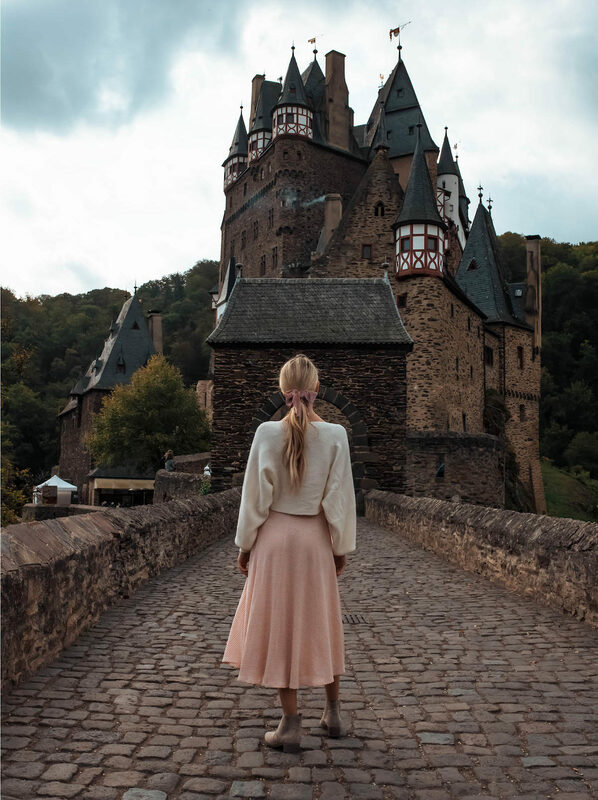 You probably recognize it from Instagram or a Disney movie– some say it served as inspiration for Cinderella’s castle! 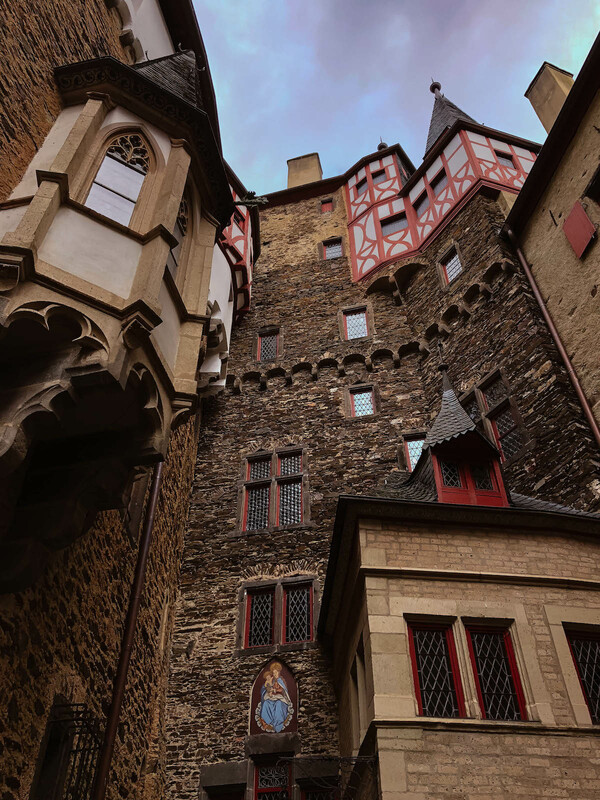 We didn’t head straight for the castle though and instead took a lazy route on side roads to the small Moselle Valley village of Cochem. 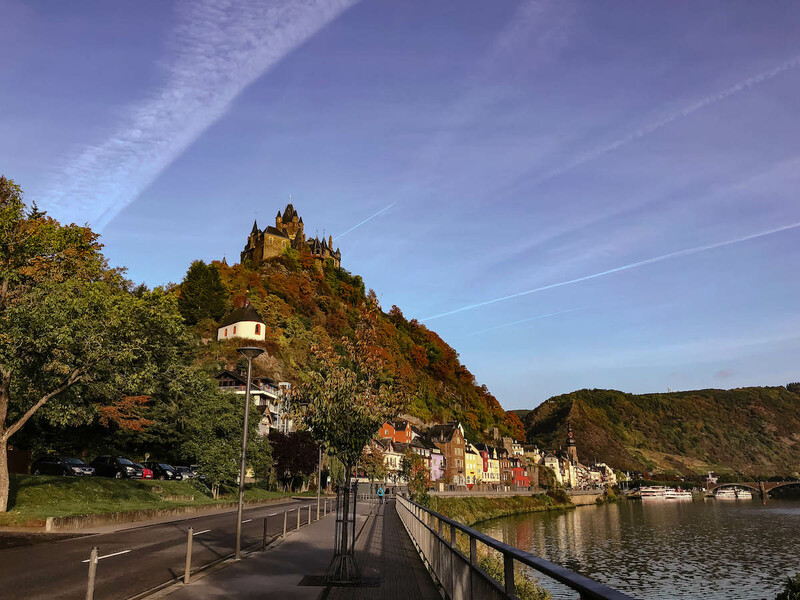 It was still so early in the morning so we only drove through stopping to take a few photos Cochem Castle and take in the beauty of the vine-covered hills along the Moselle river. Sidenote: almost every town we passed through had it’s own castle! 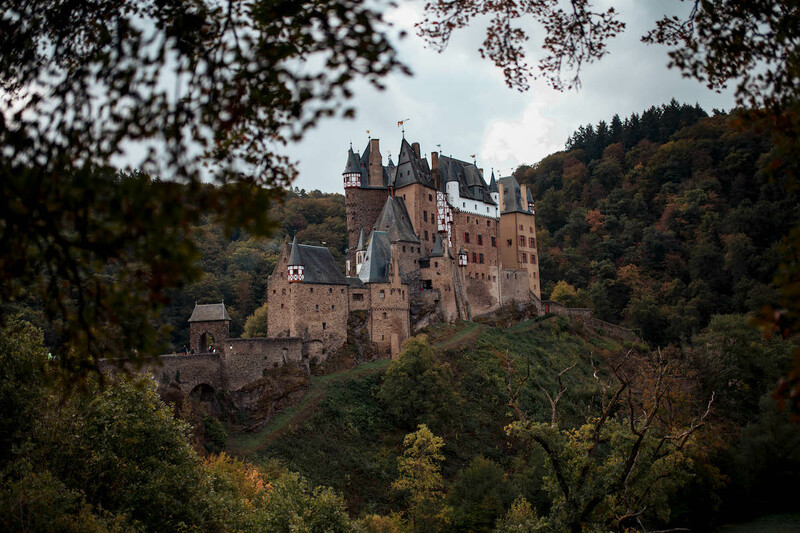 Some were just ruins and nothing as large or stunning as Burg Eltz, but still castles. I think a few had even been converted into hotels… Future trip idea? The castle comes almost out of nowhere as you exit the woods. It didn’t even seem real! Along the forest path there are some stunning angles for photos. I couldn’t stop taking pictures! The entrance to the castle itself is clearly stunning too. To this day it’s still privately owned by the same family that lived there in the 12th century. 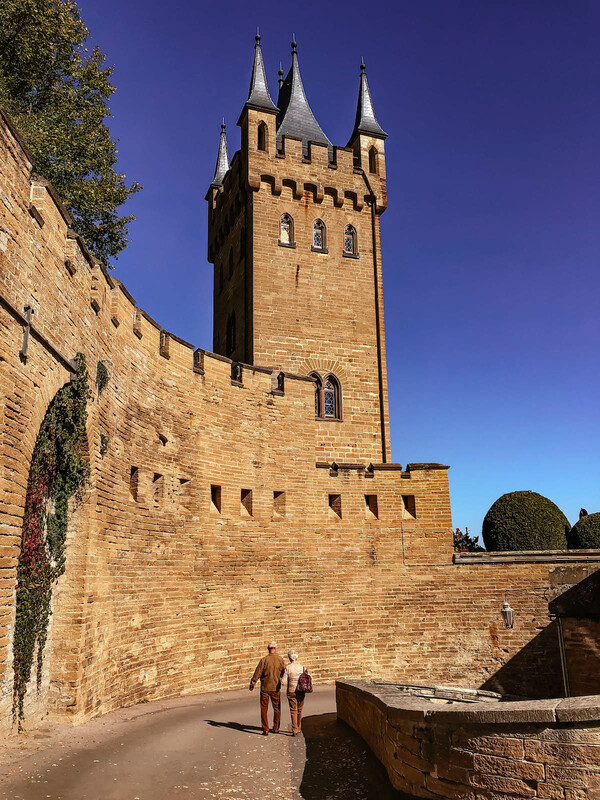 They have their own separate wing of the castle, while the rest is open to tourists between the months of April-October. Make sure you plan your trip accordingly!!! 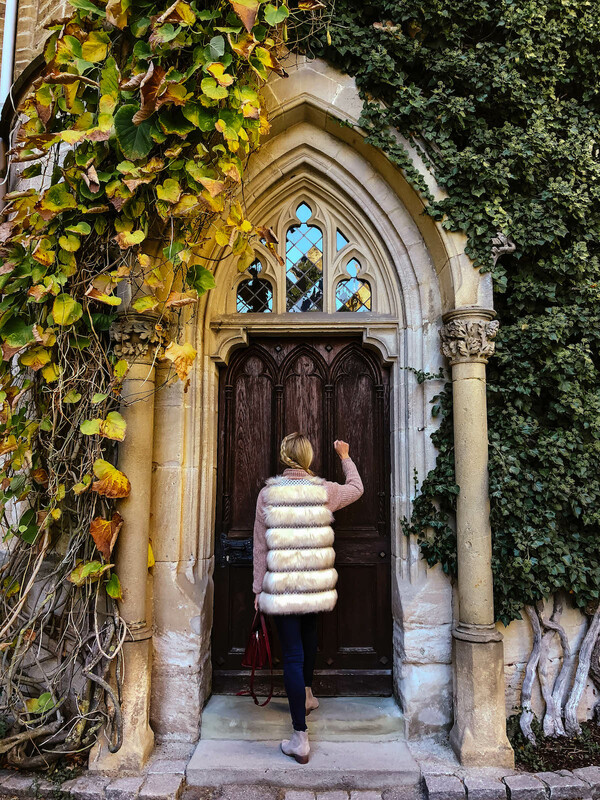 Just getting to explore the grounds and see the exterior of the castle was enough for us, but those looking to see the inside of the castle can pay to take a tour. No photos allowed though! 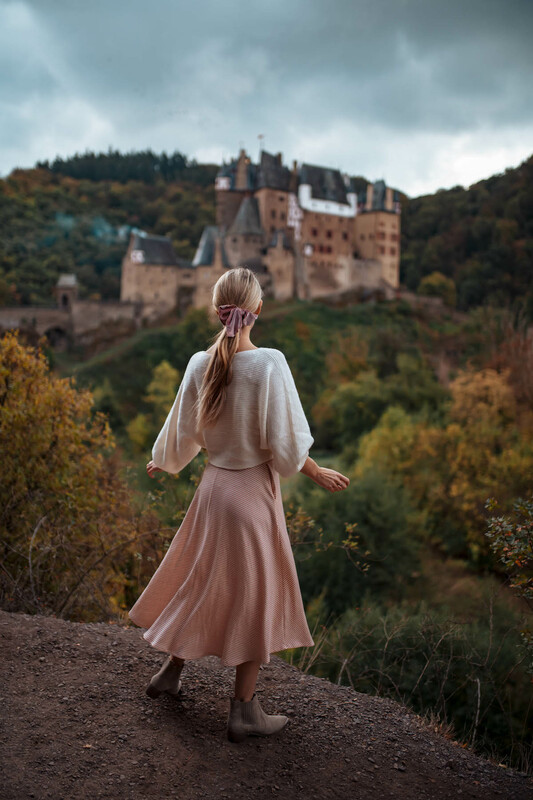 We left Burg Eltz on cloud nine. Total bucketlist moment! The rest of the afternoon we didn’t have much of a plan and drove from village to village. 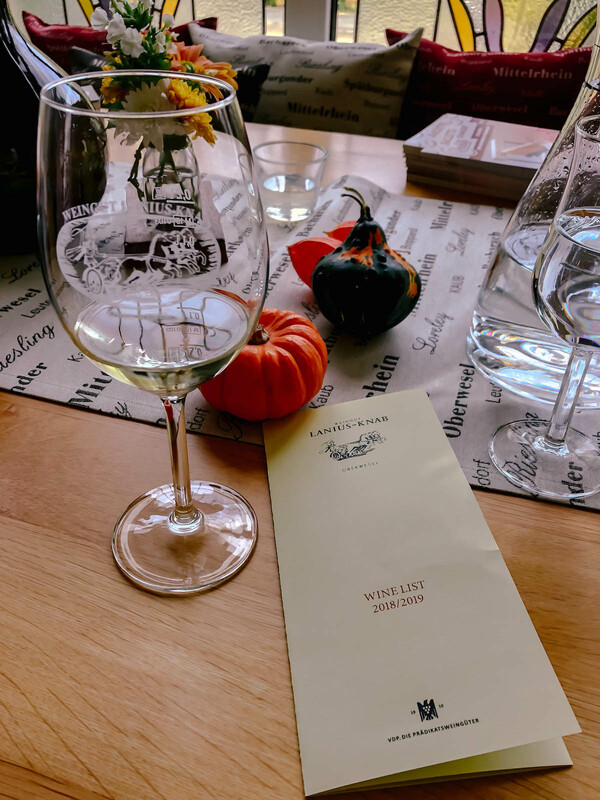 We stopped in the town of Oberwesel for a glass of local riesling at Weingut Lanius-Knab. 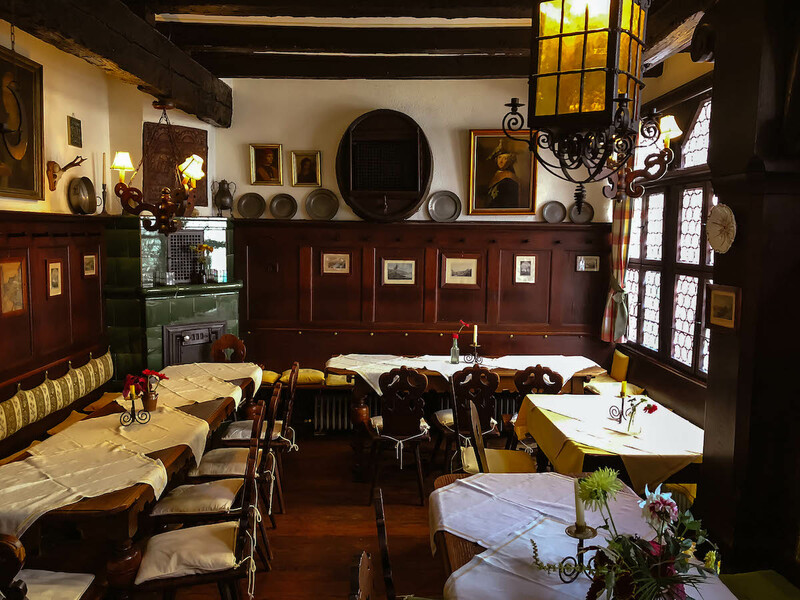 Then we had lunch at Altes Haus in the fairytale village of Bacharach. Obviously we ordered the schnitzel. 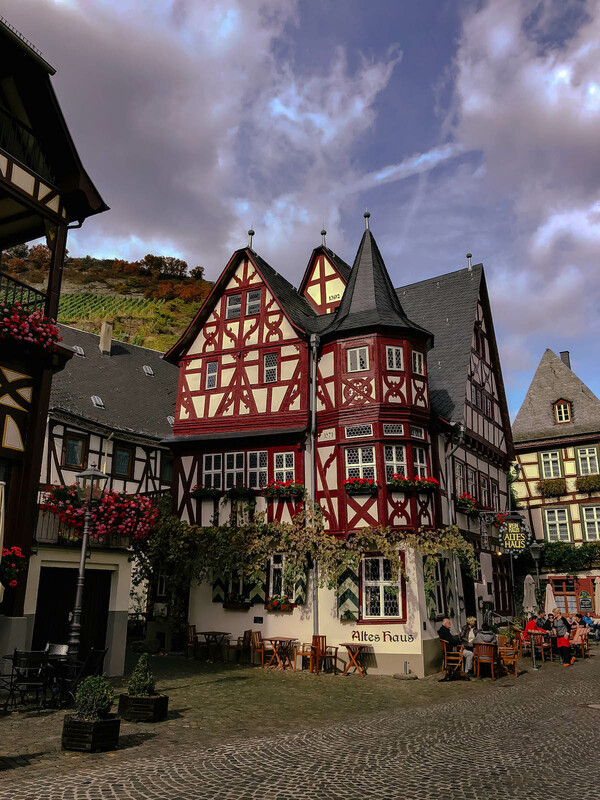 If you’re doing a similar trip definitely do not miss Bacharach. The entire town looked like something out of a movie! 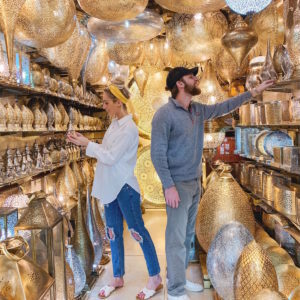 It’s definitely a place you could spend an hour or two just walking around on foot. Eventually we made our way to Heidelberg. 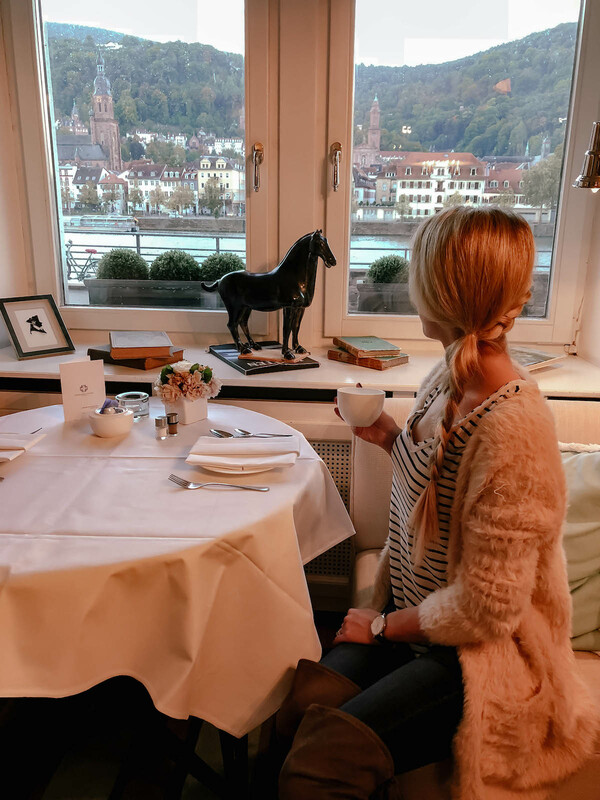 At the point it was around 4PM so we were able to check into Boutique Hotel Heidelberg Suites. I go more into our stay towards the end of the post, but I’ll tell you now it was our favorite hotel of our entire trip. 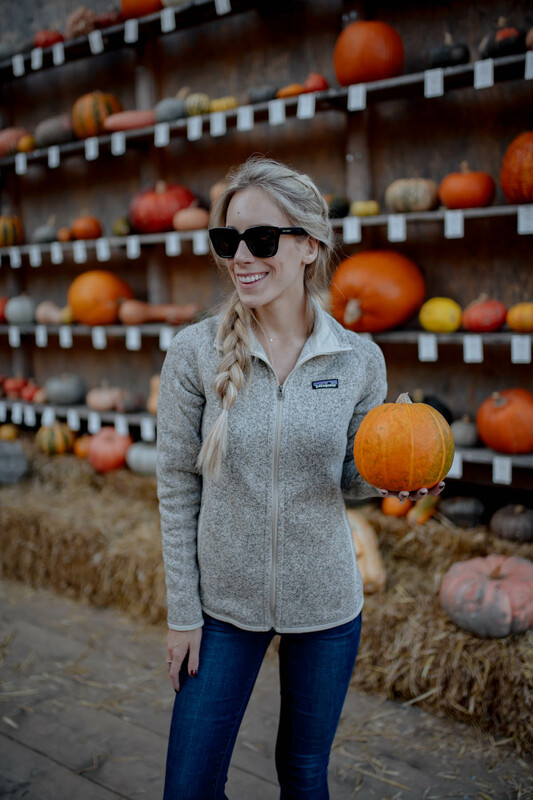 The property is just beyond gorgeous and cozy. 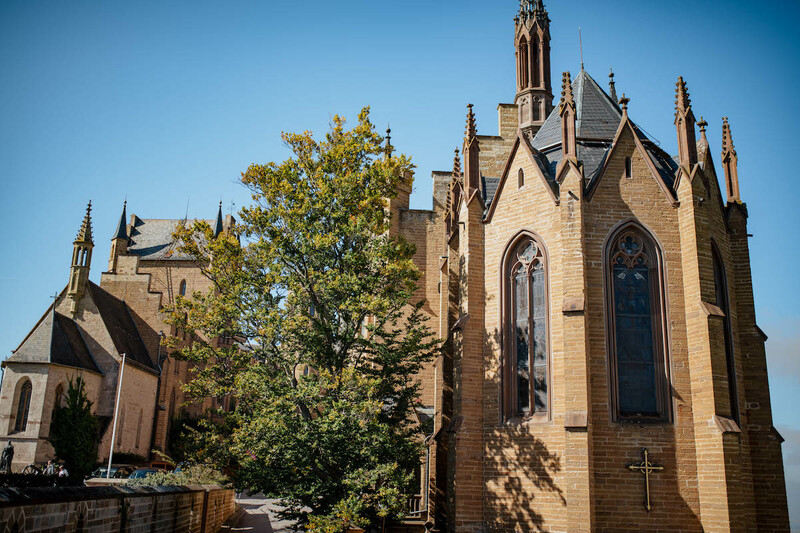 The perfect location too for exploring Heidelberg and the surrounding towns and villages. After two straight days of schnitzel we shamelessly grabbed pizza for dinner at a restaurant in Old Town Heidelberg. 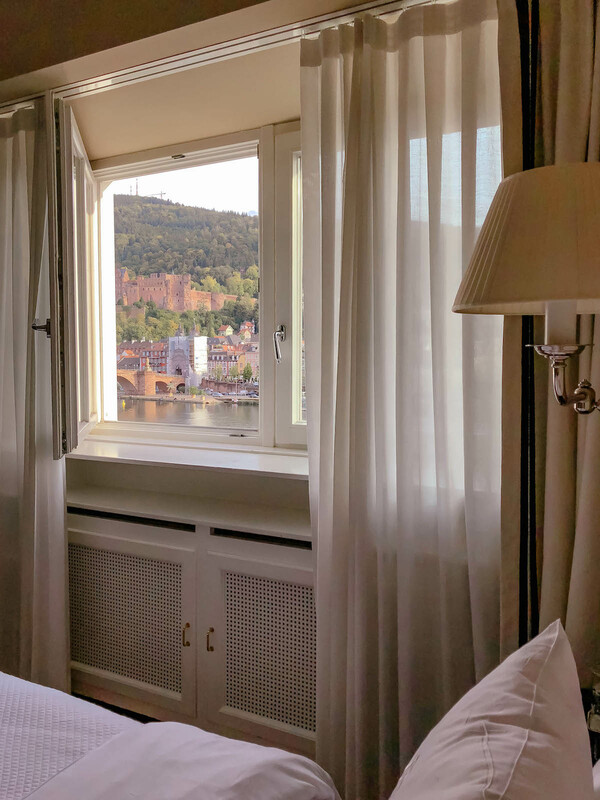 Our hotel was actually on the other side of the Neckar River, but it was a quick easy walk and we really enjoyed taking in the beauty of the river and seeing Heidelberg Castle on the hilltop. It’s truly a magical thing to see, especially all lit up at night. 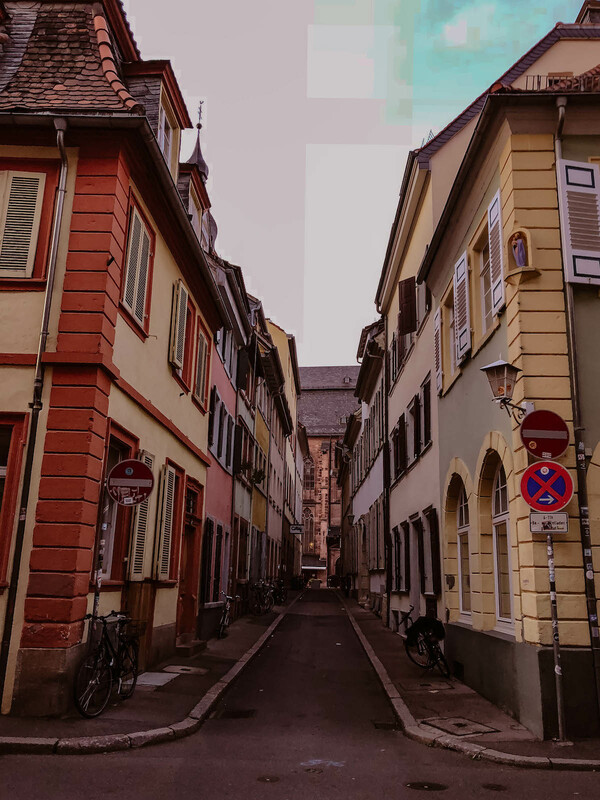 We spent some time walking around Heidelberg too. Just think cobblestone streets, lots of Baroque architecture and large open squares filled with people eating at outdoor restaurants. Heidelberg is a big university town in Germany so we noticed lots of young people and couples. Loved the vibe! Using Heidelberg as our homebase, we set off early again the next morning in hopes of checking three more castles off our bucketlist. 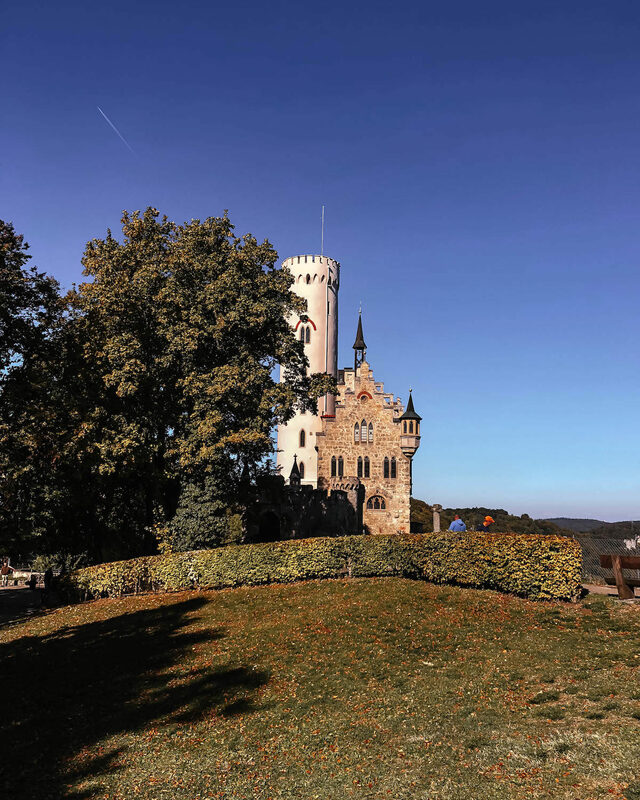 Many of Germany’s famous castles are spread across the country, but luckily there are two quite close in distance to one another: Lichtenstein Castle and Hohenzollern Castle. It’s about a 20 minute drive between the two! 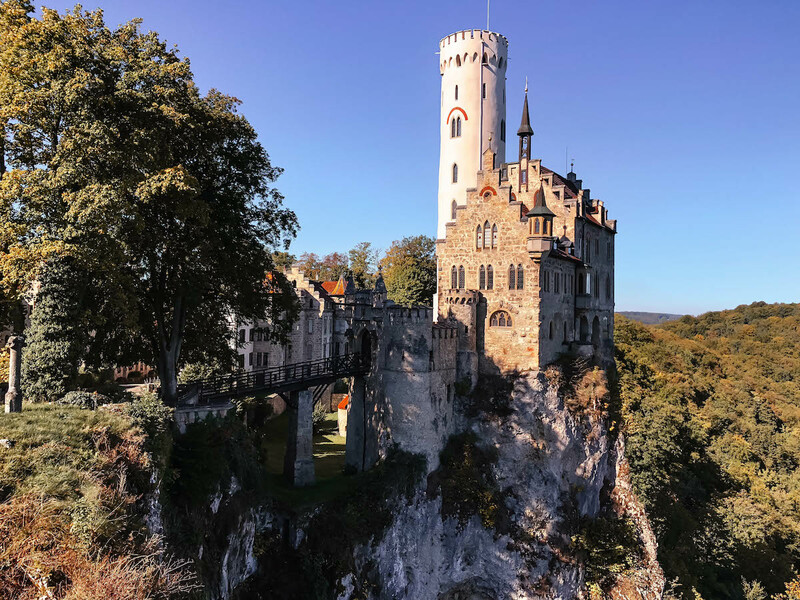 Lichtenstein Castle is another one that looks straight out of a fairytale. It’s located on a mountain directly on a cliff overlooking the Echaz valley. It was a gorgeous clear day that we were there and the view was fantastic. 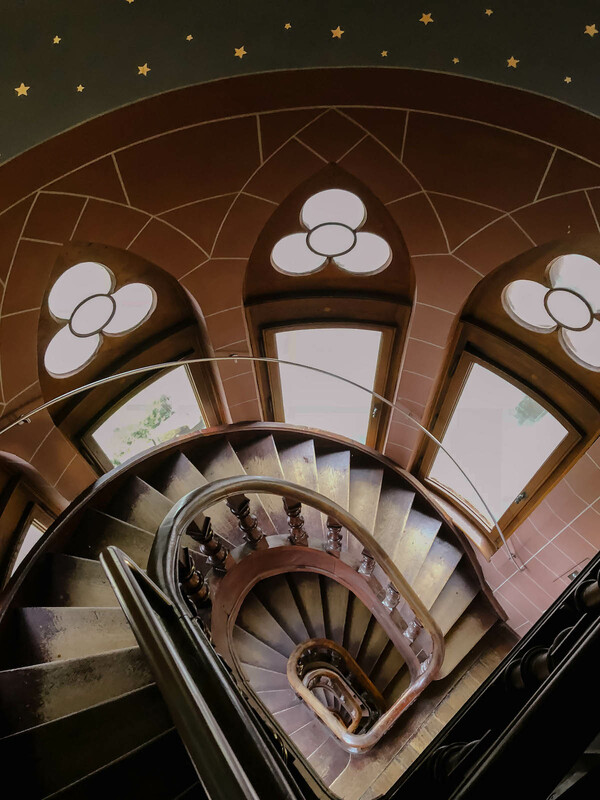 The castle itself is built in the gothic revival style and still privately owned to this day and run solely as a tourist attraction. 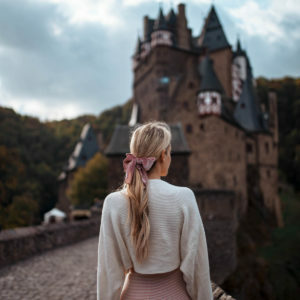 Similar to Burg Eltz, you can pay to take a tour inside however photos are prohibited. You know the song “Castle on a Cloud” from the musical Les Miserables? 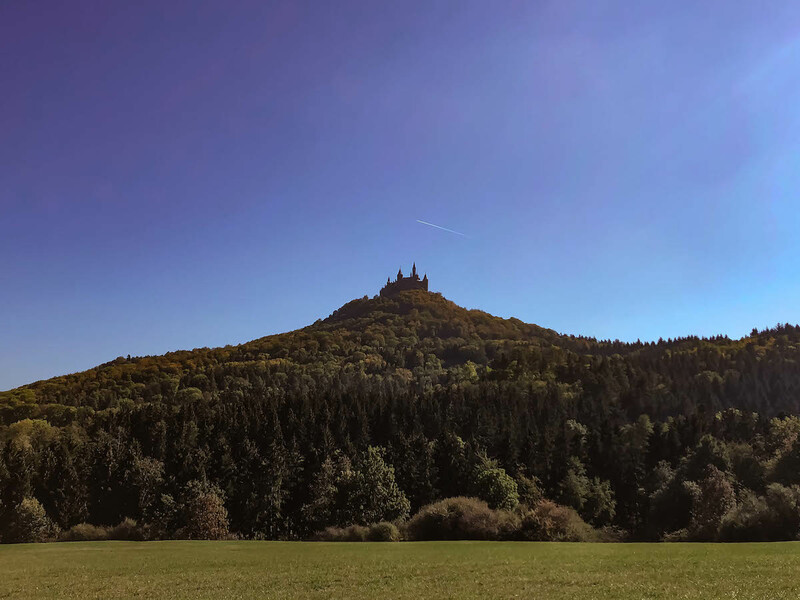 That’s what immediately popped into my head driving up to Hohenzollern Castle. I swear I even expected a dragon to just appear and land on the roof. Almost our a nowhere a large hill appears and there you see the castle. 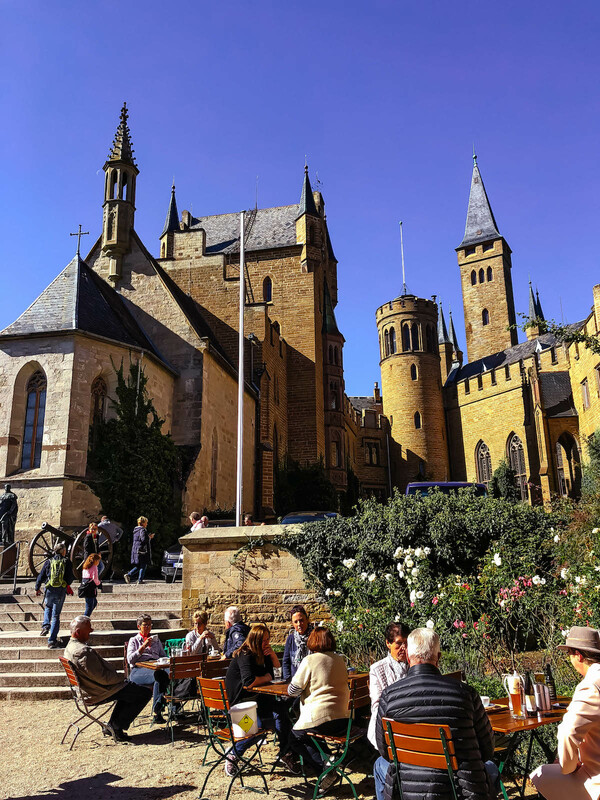 Compared to petitely-sized Lichtenstein Castle, Hohenzollern is HUGE most likely due to it’s history as the ancestral seat of the German royal family. 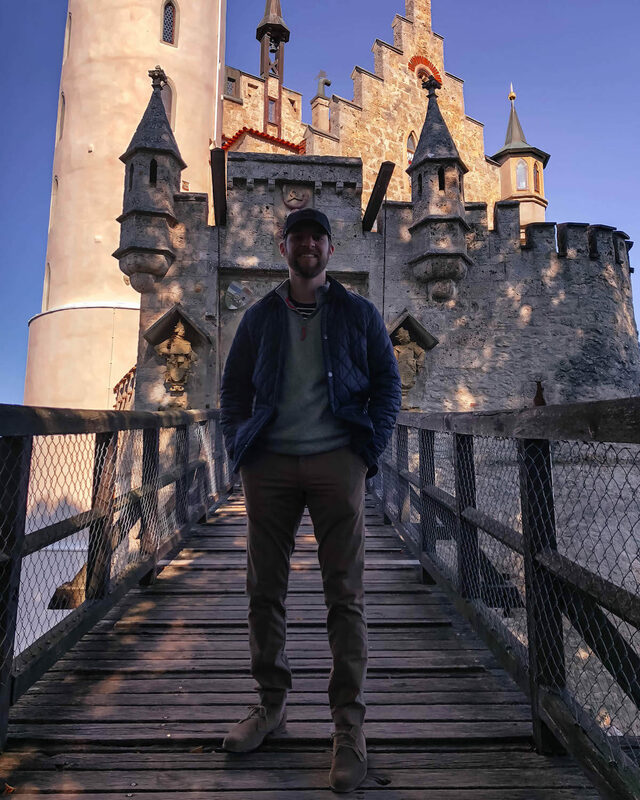 Yes, I learned on this trip that Germany has a royal family– who knew? 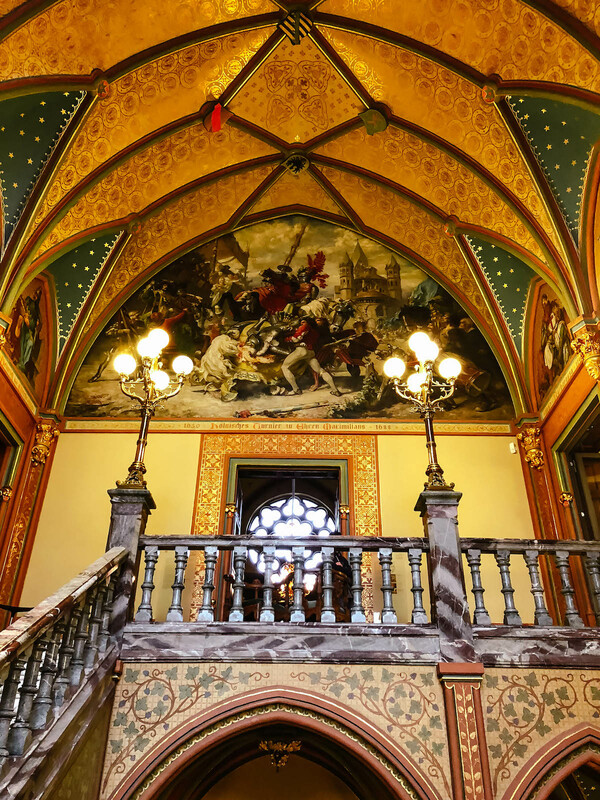 Though the German monarchy was officially abolished in 1918, the family still maintains their titles and ownership of the castle. 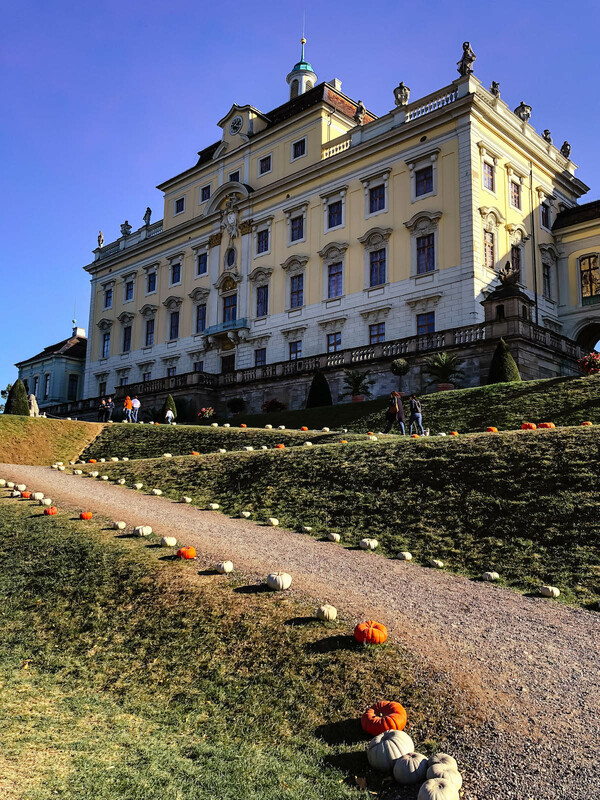 Whenever Prince George Friedrich and his family are staying at the castle, they will raise the Prussian flag over the grounds. It would’ve been so cool if they’d been there when we visited! After parking, we took the tram up to the castle and did our own exploring on foot. There’s even a brewery if you’d like to grab drink or have lunch on the grounds! 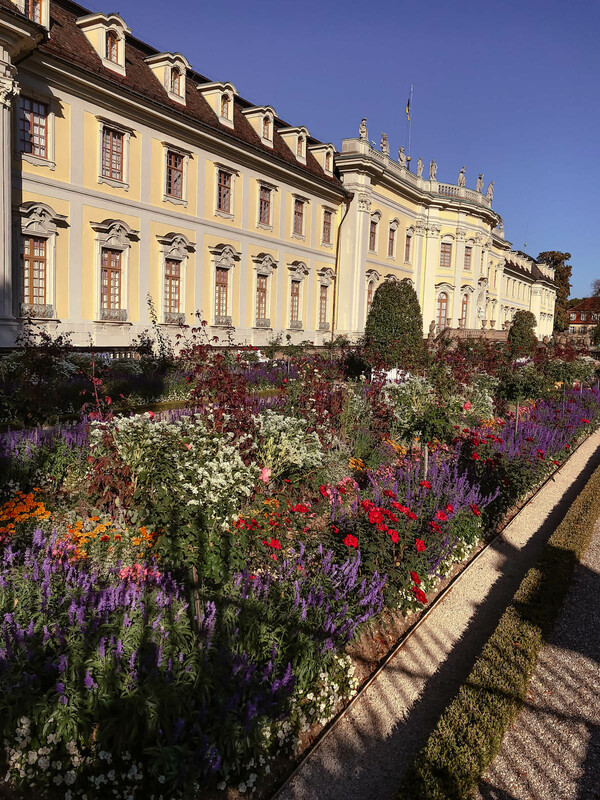 Our last stop of the day before heading back to Heidelberg took us to Ludwigsburg. In my Eurotrip packing post I’d mentioned how my grandparents, mom and aunts lived at a US military based in Germany for a few years while my Pop served as a doctor taking care of soldiers wounded in the Vietnam War. Well the town they lived in was Ludwigsburg! 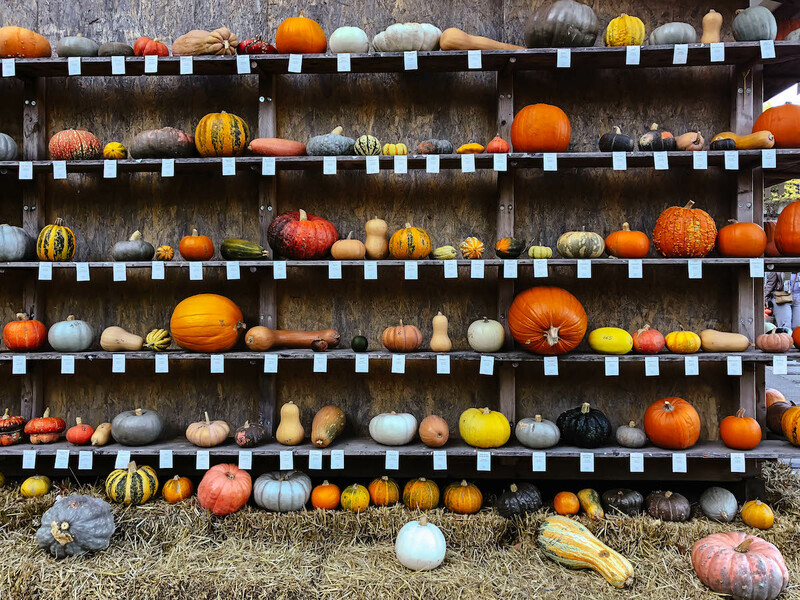 I did some research before our trip and found out not only is it home to Ludwigsburg Palace, but every October there’s a famous PUMPKIN FESTIVAL. The timing could not have been more perfect. I mean, there was no way we could not go! 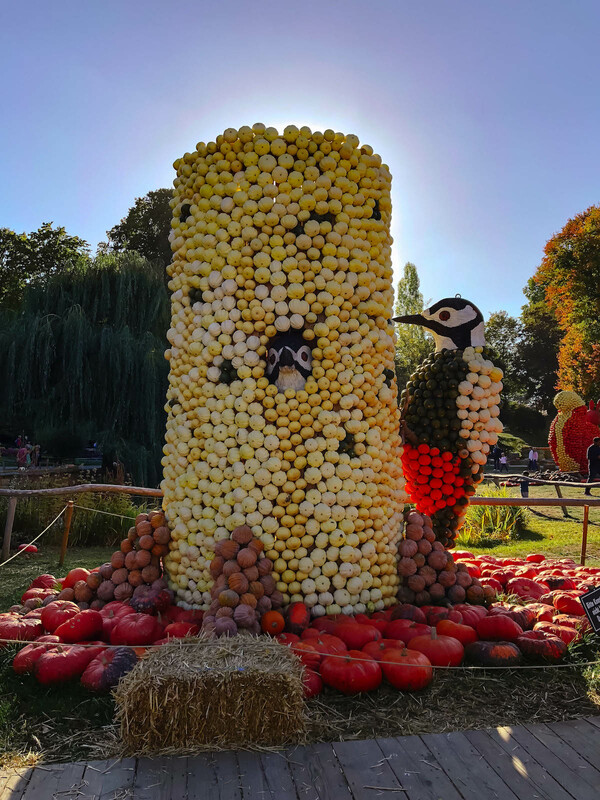 As you can see the festival was #fallgoals (I’d never seen so many different pumpkins in my life) and the palace every bit as gorgeous as I expected. 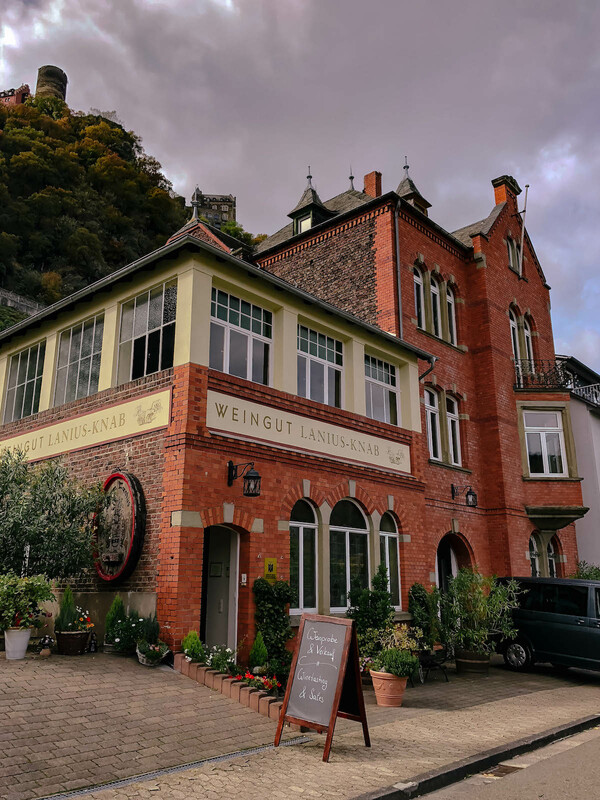 By the time we made it back to Heidelberg we were running on fumes, but that didn’t stop us from gorging ourselves on traditional German brewery food at Kulturbrauerei Heidelberg. 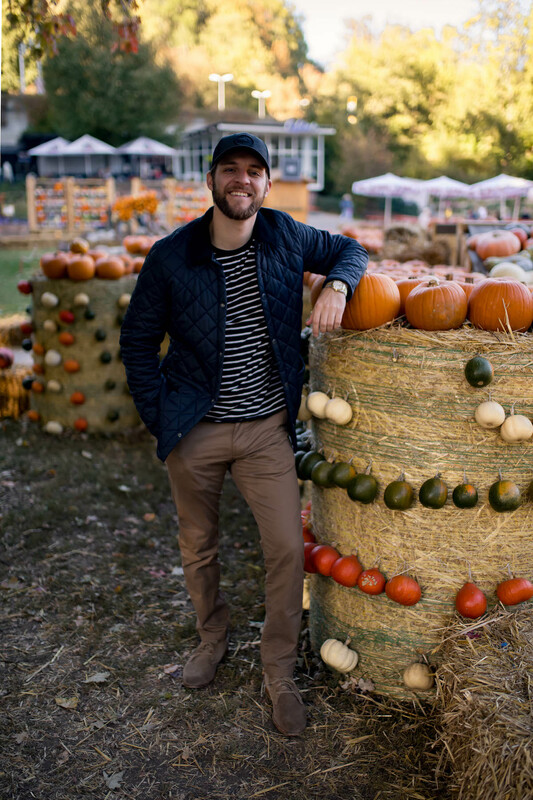 Definitely add this spot to your foodie list if you’re visiting! Our meals were delicious and the beer was so good. 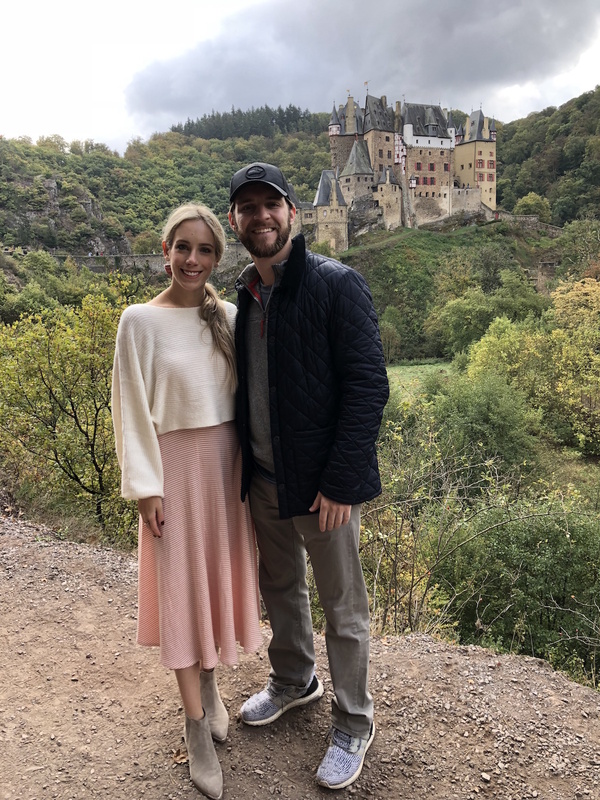 It was the perfect way to end three incredible days in Germany! 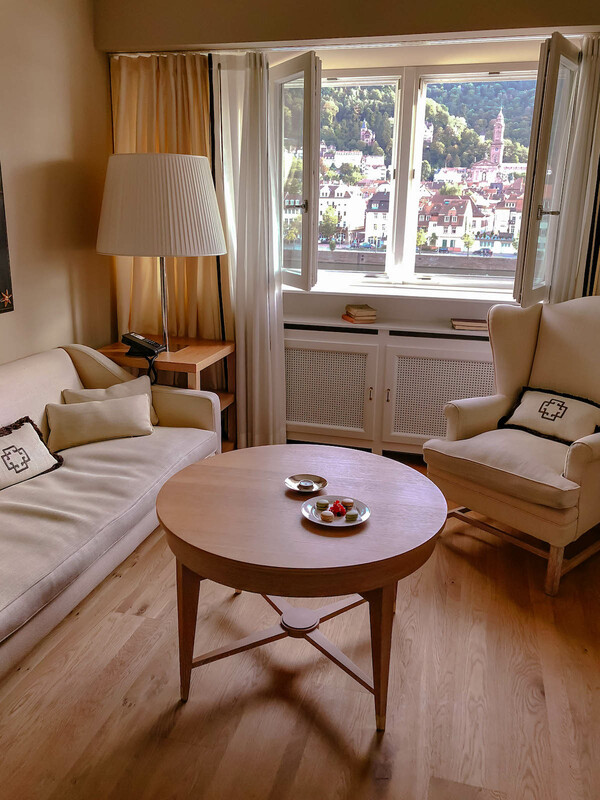 If you’re planning a trip to Heidelberg I cannot recommend Boutique Hotel Heidelberg Suites enough. 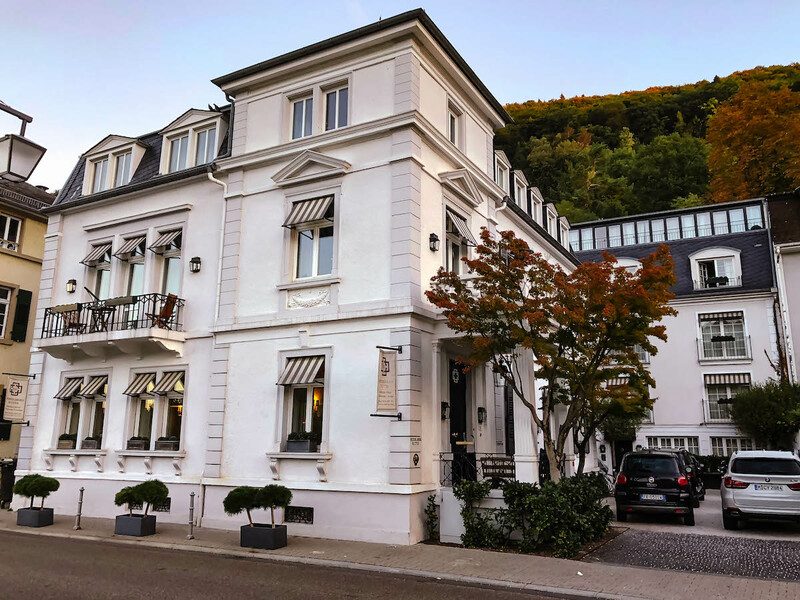 The two nights we stayed here were the highlight of our hotel experiences in Europe. 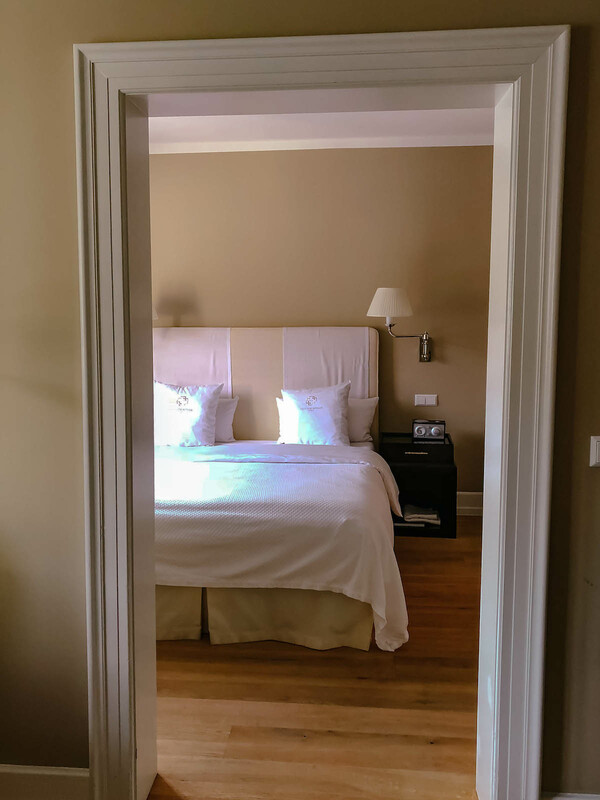 Every guest room is suite-style so if you’re looking for space to truly unwind and relax in luxury, this is the hotel you come to. 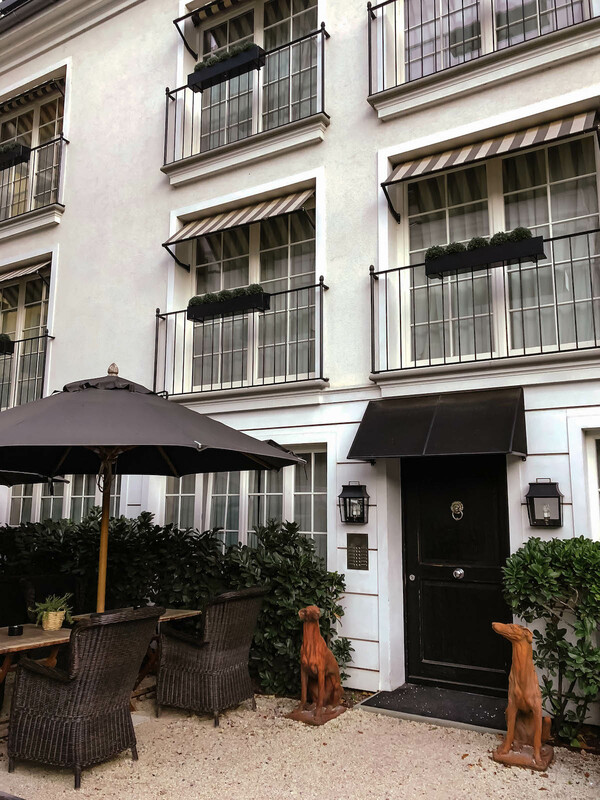 After having stayed at a couple different Small Luxury Hotel-affiliated properties, we’ve come to expect to always be impressed anytime we book a visit at one of their member hotels. 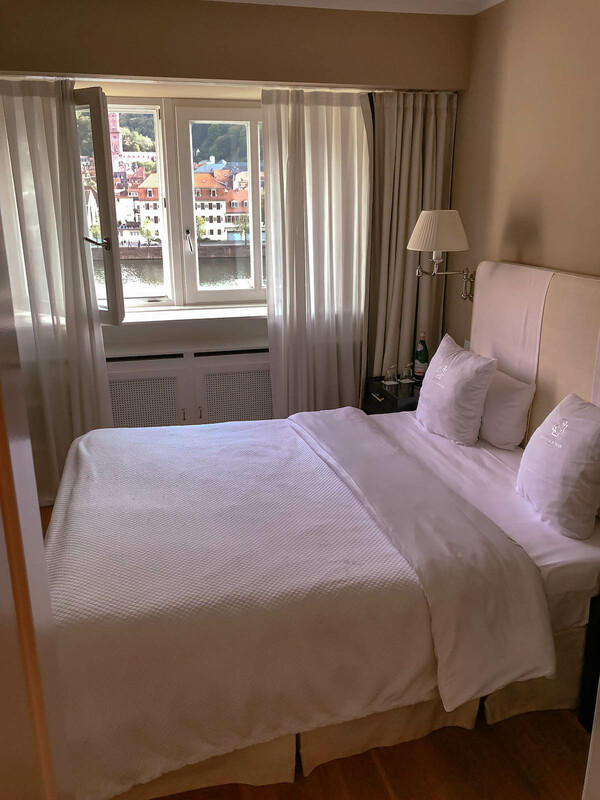 I mentioned that the hotel is on the other side of the Neckar River and we really enjoyed the peace and quiet since downtown Heidelberg was quite bustling and didn’t look very accessible by car. Heidelberg Suites has parking available and a lovely breakfast that we happily inhaled both mornings. Did I mention the rooms have a view of THE CASTLE? That was the cherry on top for me. Laying in bed each night and looking out at it across the river on the hill was so dreamy! 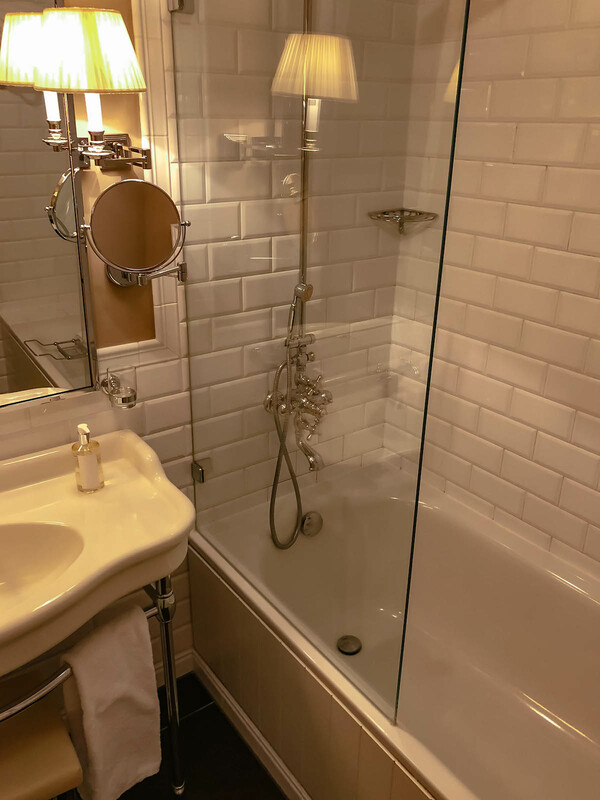 Our bed and bathroom at Heidelberg Suites was drool-worthy as well. Nick and I are both snobs when it comes to linens and towels and rarely do we find a hotel where we’re impressed by both! As I mentioned in my initial Eurotrip Itinerary post, renting a car in Europe was so easy. I highly recommend using Sixt. There was a large selection of vehicles and there are locations all across Europe making it very easy to pick up a car in own city and return it in another. You don’t just have to stay in one country either. 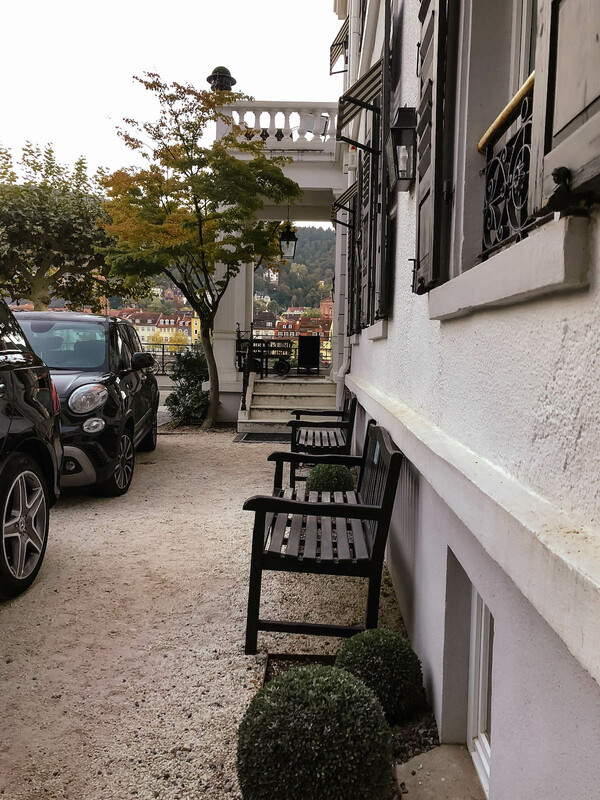 We first picked up our car in Germany and returned it at another location in France. What a magical trip! It brought back so many wonderful memories for me. I wish I had all the energy you two have and begin all over once more. 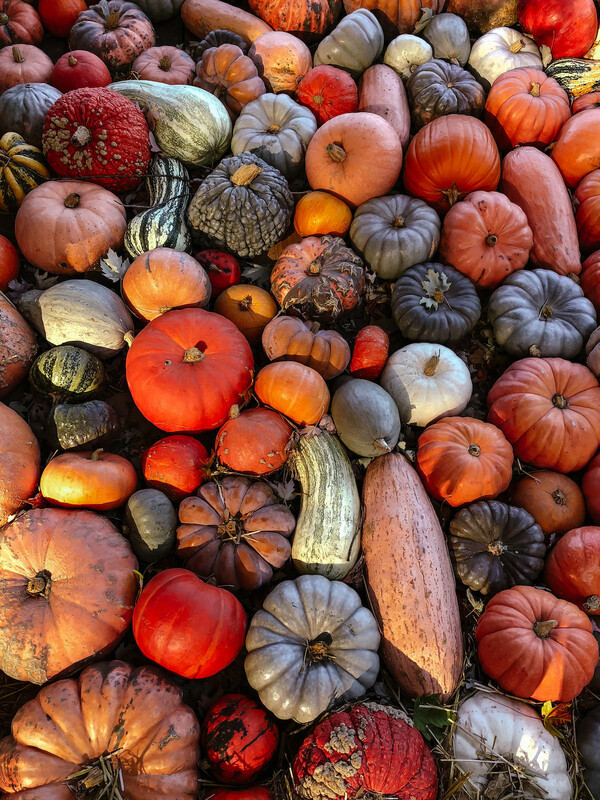 You’ve done a perfect job of sharing the Germany experience. We saw our friend’s (and his son’s) pictures a few weeks ago. 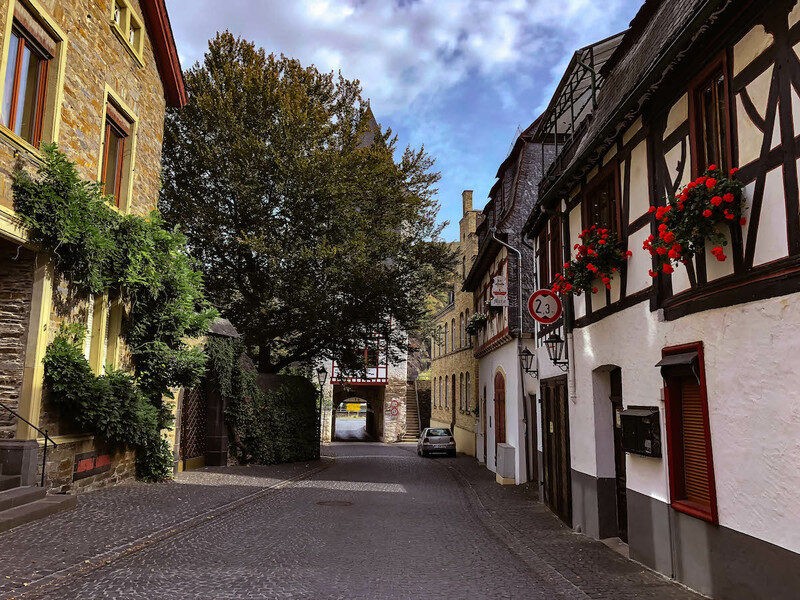 Germany is truly beautiful throughout! Your style (especially the Heidi braids) was reflective of the German culture. I pray I can visit with my college age son, soon! Hubby if I can promise and Ireland stop!! Not much has changed since. 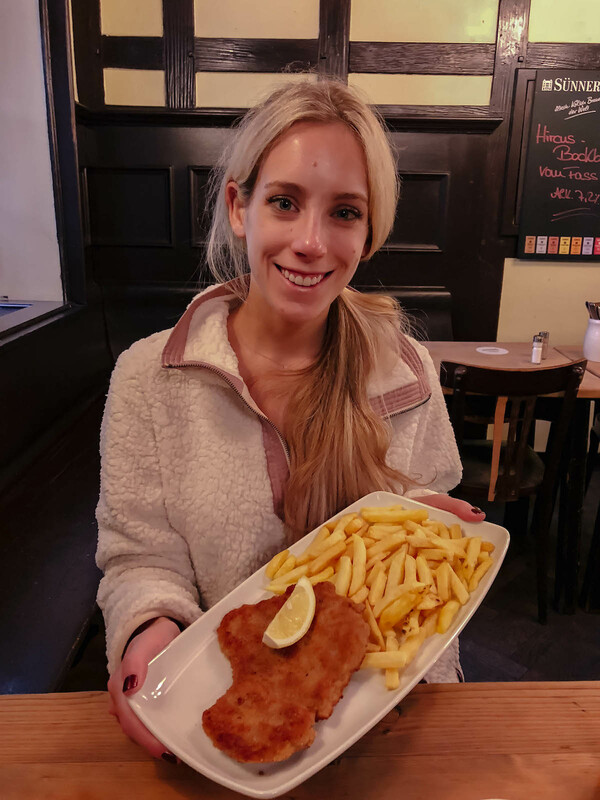 Need some of that schnitzel mit pomme frites. This is so amazing! I was in southern Germany for two months this past summer and I loved reading about your experience! Getting some serious nostalgia vibes even though you were in a different part, thanks for sharing! 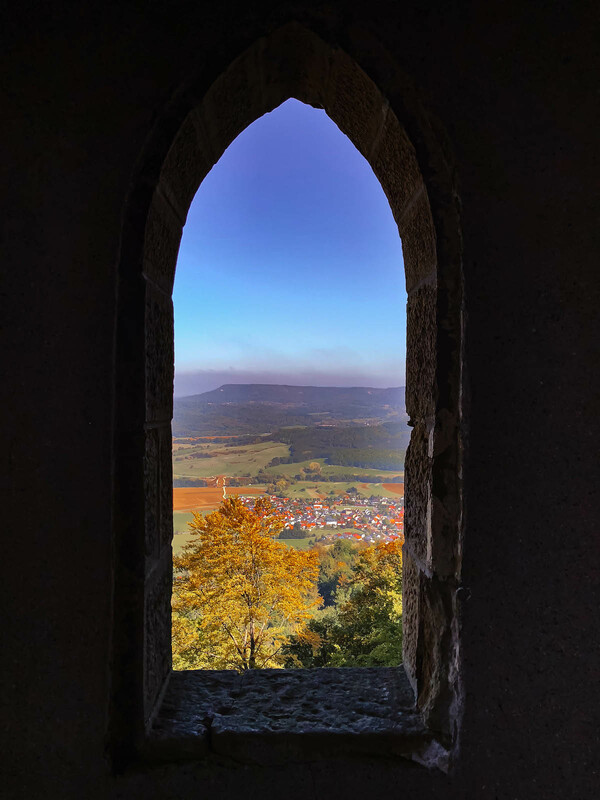 I am recently planning to visit the place and your suggestions and details have helped me quite a lot in exploring Germany to the fullest.